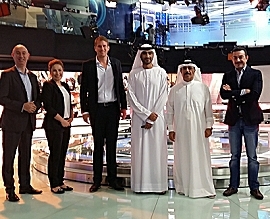 Eurovision signs deal with DMI in Dubai for broadcast services. Dubai, February 2017: Eurovision has announced a partnership agreement with Dubai Media Incorporated (DMI) to provide worldwide news gathering broadcast facilities and a permanent connection to the Eurovision global fibre network (FiNE). DMI will now be able to access the full range of services that Eurovision provides to broadcasters to enhance their news reporting as well as being able to benefit from tailor-made packages designed to meet their individual needs. "We are proud to be offering reliable and robust connectivity to DMI via our network,” said Graham Warren, Director of Network at Eurovision. ”At Eurovision we aim to be the standard-bearer for quality of service and reliability around the world. Extending our services to Dubai Media Incorporated, one of the largest media organisations in the United Arab Emirates, reinforces our forward thinking approach in understanding our customer’s business needs better than any other organisation. This agreement now means that Dubai TV, Dubai Sports and Dubai Racing will be able to rely on a strong network and broadcast services for their media requirements.” he added. “Our association with Eurovision will help us to source content from various locations around the world by tapping into their worldwide network. This will result in a better viewer experience. Eurovision’s robust worldwide connectivity and state of the art facilities in major cities will ensure that we can receive our content at very short notice for any important event anywhere in the world. For us, this is essential so we can ensure that we deliver the latest news to our viewers on time”, explained Mr. Lootah.